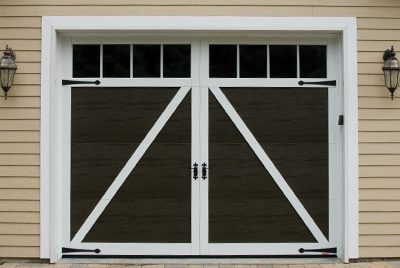 Would you like to give a country style to your garage door? We have decorative hardware reminiscent of wrought iron to give the look of carriage house doors of days gone by. 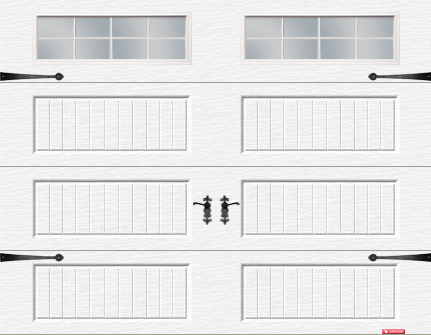 Here are some tips to harmonize your garage door with the rest of your home. To ensure whether you can or cannot add windows to your garage door, we recommend contacting us so we can evaluate your current situation. We can also provide you with a free written quote. What size are the hinges and handles? Everything is screwed onto the door. The kit can be easily installed on an existing door. Can I install them myself? Yes. You can install these decorative hardware items. It would be our pleasure to provide you with the installation instructions. We can also do it for you. Contact us or go to our Design Centre and create your own garage door.